Bright Beginnings has designed several handouts and postcards with recommendations of how you can support early childhood development. View the new data below and click on each item to download, print, and distribute with your community. 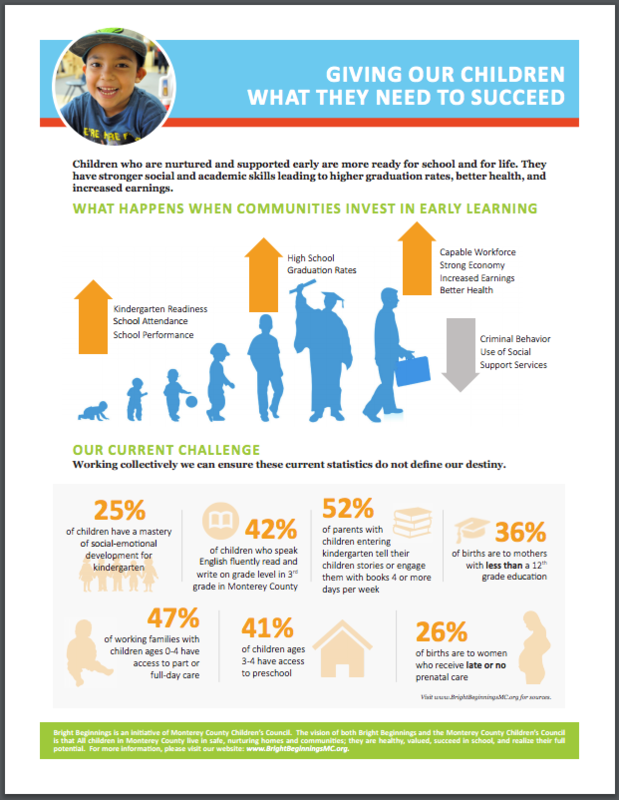 Learn more by visiting our Bright Beginnings Data webpage. To order copies of the new Bright Beginnings postcards, please contact Karen Gorman, karen@first5monterey.org. Click here to view and download the above Early Care Education postcard. Click here to view and download the above Language Literacy postcard. Click here to view and download the above Prenatal Care postcard. Click here to view and download the above Social Emotional postcard. Click here to view and download the above Maternal Education postcard. Click here to view and download the above Early Literacy Activities postcard. Click here to view and download the above Bright Beginnings’ Cause-Specific one pager.